From Goodreads ~ With his career stalled and the office abuzz about his soon-to-be-ex-wife’s indiscretions, Ottawa bureaucrat Charlie Hillier is desperate for a change. So when the chance at a posting to the Canadian embassy in Havana comes up, he jumps at it, grateful to get as far away as he can from his ex and his dead-end job at Foreign Affairs headquarters. 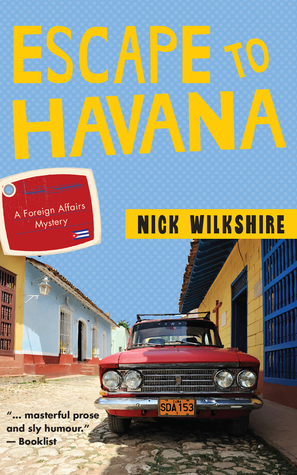 At first, exotic Havana seems just the place to bury his past and start anew but he didn’t count on finding a couple of kilos of cocaine under his bedroom floor, the kidnapping of a fellow diplomat or the unsettling connection he uncovers between the former occupant of his house and a Colombian drug-runner. Before long, Charlie’s only concern is whether he’ll survive his posting at all. Charlie is middle-aged, married and has a boring job with Foreign Affairs headquarters in Ottawa. When he discovers his wife has been cheating on him, they get divorced and Charlie quickly gets transferred to Havana looking for a fresh start. He is happy with a lavish home to live in (with a pool). What he thought would be a quiet job ends up keeping him busier than he'd thought but he doesn't mind. His new boss asks him to dogsit his rambunctious dog, Teddy, and how could he say "no"? When he starts getting strange visitors looking for the former resident and finds cocaine hidden under his bed, he's not sure what to do so he keeps this information to himself. He's concerned the Cuban officials wouldn't believe him. This is the first book I've read by this author and I liked it. I found the writing style funny at times and it moved at a good pace. You really get a sense of what Havana in 2014 was like. It is written in third person perspective, from Charlie's point of view. I found it odd, though, that everyone but Charlie is referred to by their last names. As a head's up, there is swearing and adult activity. It is the first in the A Foreign Affairs Mystery series and I look forward to reading the others.